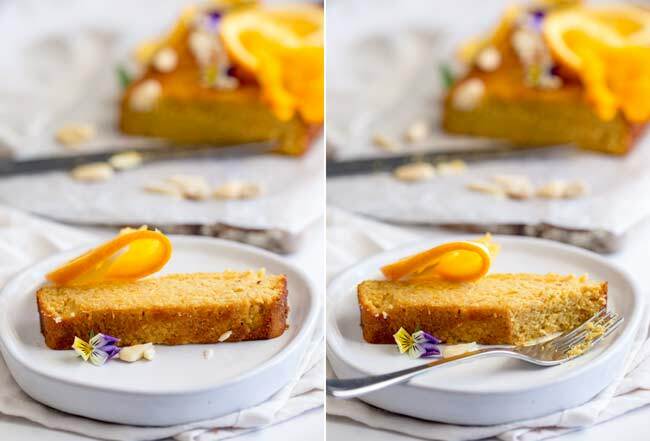 This Flourless Orange and Almond Cake is the easiest and most delicious cake EVER! 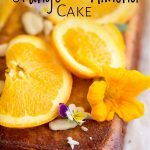 It uses a whole orange and almond meal/almond flour, which keep it moist as well as making it gluten free and dairy free. The cake is simple to make, so moist without the need to drench it in syrup and will keep for up to a week. Plus with my easy decorating tricks you’ll have a Best Orange Cake ever. 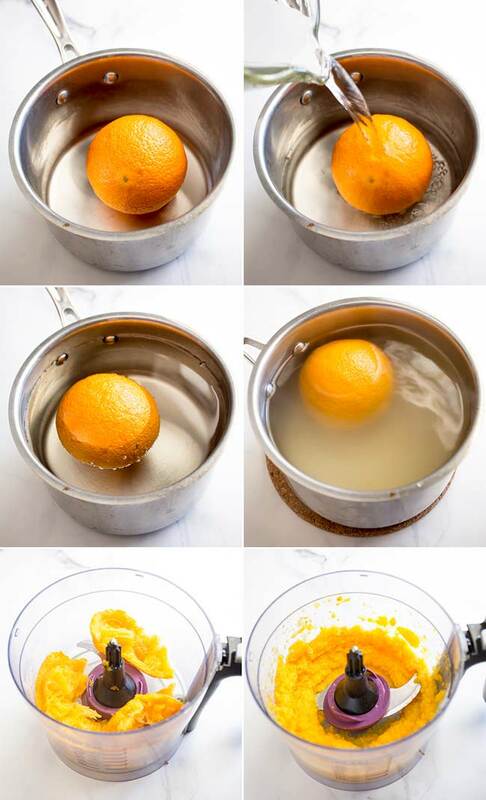 How to make gluten free orange cake. That is all there is to it. It takes some time because the orange cooks for an hour and then the cake takes 50 minutes, but I often cook the orange before bed and then make the cake the following day. You use a whole orange? Yes, cooking the orange in boiling water until it is soft and then you can use the whole orange! Skin, pith and flesh. The only thing you need to remove is any pips. But to be honest I am not that fastidious about it. I just have a look as I gently break the orange into a few pieces. Cooking the orange takes around an hour, but it makes your house smell amazing! And the resulting pulp is what makes this orange cake so delicious and moist. You can cook them for 15 minutes in your pressure cooker if you have one. Flourless? So what do you use? Instead of flour this cake is made with almond meal (also called ground almonds or almond flour). It works fabulously to make a soft moist cake. You can buy almond meal/ground almonds in the grocery store, or you can buy almonds and grind them down yourself in the food processor. It takes a while, but keep a close eye on it, otherwise you could end up with almond butter!!!! Is this a light and fluffy cake? No, this isn’t light and fluffy, it is a denser moist cake. Think syrup soaked pound cake rather than sponge cake. It is perfect for eating with a fork at the end of the meal. I like to serve it with some fresh whipped cream. And if I am feeling like something a bit different I add a drop or two of rosemary essential oil to the cream. So delicious with the cake! However, when I cooked this the other day I didn’t have any cream and I have to admit it didn’t need the added calories. 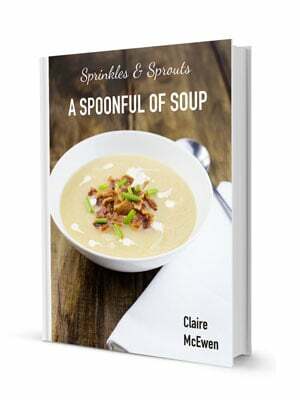 So serve this naked or with a dollop of cream. Both will be delicious! The possibilities are endless here!!!!! 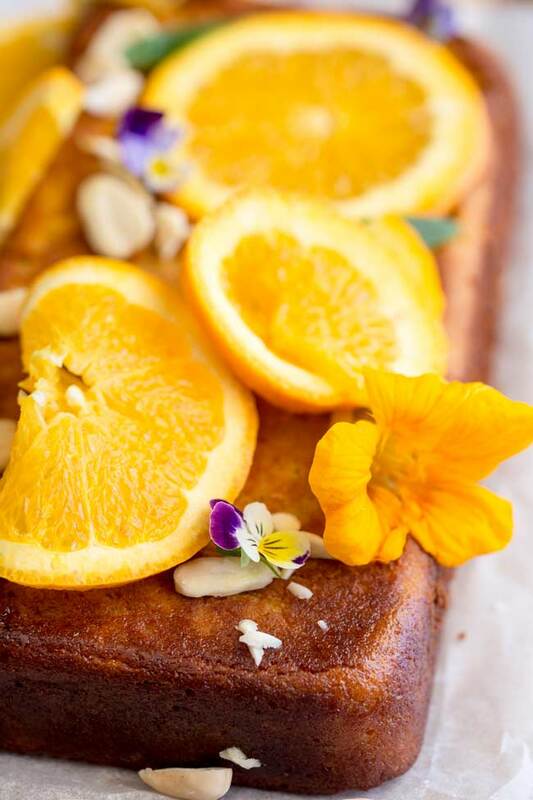 I like to scatter chopped almonds over the top and then arrange a few slices of orange and some edible flowers on it. It looks beautiful. 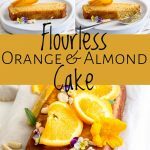 This Flourless Orange and Almond Cake is the easiest and most delicious cake EVER! 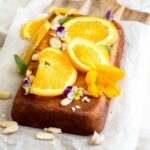 It uses a whole orange and almond meal, which keep it moist as well as making it gluten free and dairy free. The cake is simple to make, so moist without the need to drench it in syrup and will keep for up to a week. Plus with my easy decorating tricks you’ll have a Best Orange Cake ever. Put the orange in a small saucepan and cover with cold water. Bring to a boil and simmer for an hour, topping the water up if needed. Remove the orange from the water and let it cool. Whilst the orange is cooling pre-heat the oven to 340ºF/170ºC. Butter and line a 9″ x 5″(23cm x13cm) loaf pan. Break the unpeeled orange into the food processor, removing any pips as you go. Blitz the orange until you have a rough pulp. Push the sides down and give it another whizz. Add the eggs to the orange and whizz gently to combine. Add in the brown sugar, almond meal, lemon juice and baking powder and give the mixture a whizz until it is all combined. Pour the cake mixture into the prepared tin and cover with foil. Bake the cake for 40 minutes, then remove the foil and cook for a further 10 minutes. Allow the cake to cool completely in the pan. To serve the cake, carefully invert it to a serving plate. 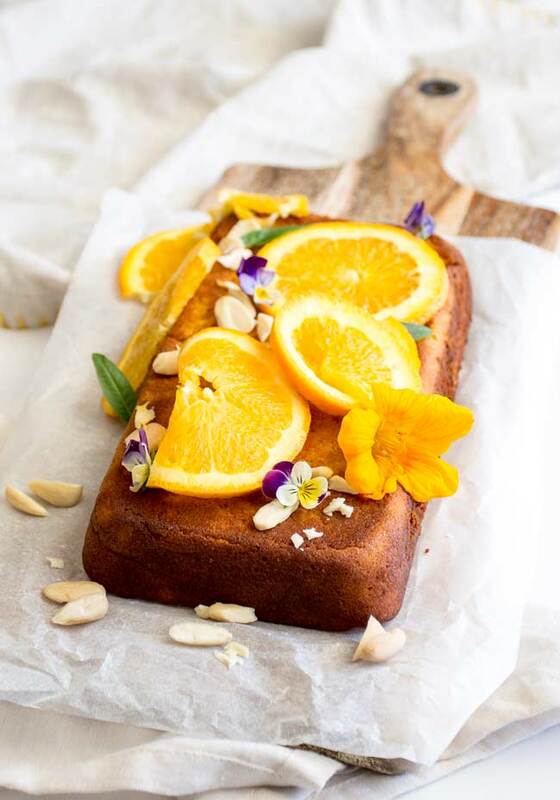 Then decorate with slices of orange, chopped almonds and edible flowers. Almond meal is also known as almond flour or ground almonds and is easy to find in the grocery store. You can buy whole almonds and grind them down yourself in the food processor. It takes a while, but keep a close eye on it, otherwise you could end up with almond butter!!!! If you are making this specifically for someone who cannot tolerate gluten then make sure your baking powder is gluten free. 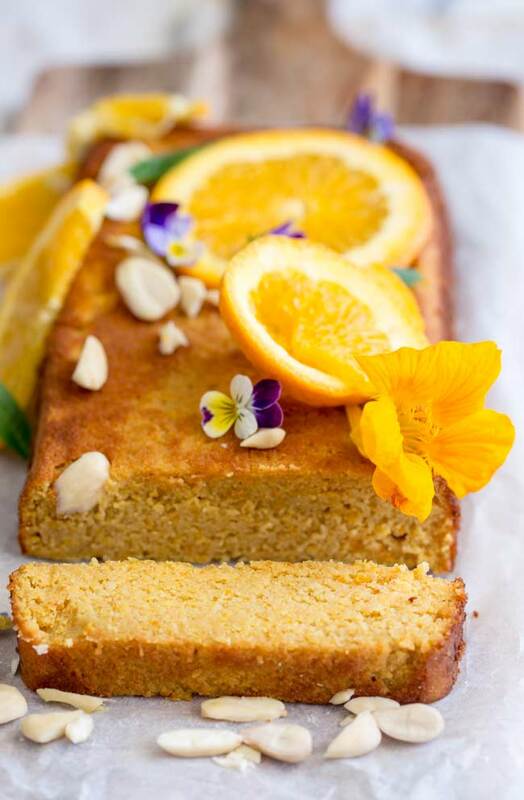 If you love food why not subscribe to my newsletter, I will drop you an email every now and then, just to say hi and send you a couple of recipes I think you might love, like this Flourless Orange and Almond Cake . I prepared this cake yesterday, it’s too tasty i liked it very much. Thank you so much for this cake recipe. I am so happy you enjoyed it Megan, it is such a moist cake isn’t it? !